Black and white photograph showing a salesmen from Deverell Motors presenting a new 1951 Fordor to an unidentified couple. 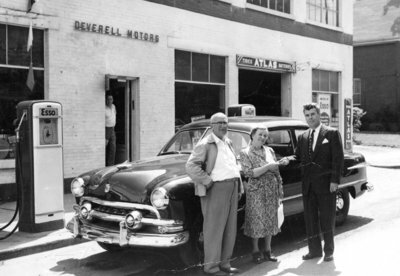 Deverell Motors was operated by Robert M. Deverell until he retired in 1953. The building, located at 301 Dundas Street West, was built in 1915 and demolished in 1964. Couple Wins New Car at Deverell Motors, c.1951, Photographer Unknown. Whitby Archives 01-000-400.